RIDGID® threading machines and pipe fabrication tools are the foundation of our heritage and brand promise to deliver the most innovative tools in the industry. If your job depends on joining, forming or connecting pipe, RIDGID threading and pipe fabrication equipment brings confidence to every connection. With construction that’s durable beyond compare and components that are engineered to work in the most extreme environments, there’s a reason more expert tradespeople trust RIDGID than any other pipe fabrication brand. 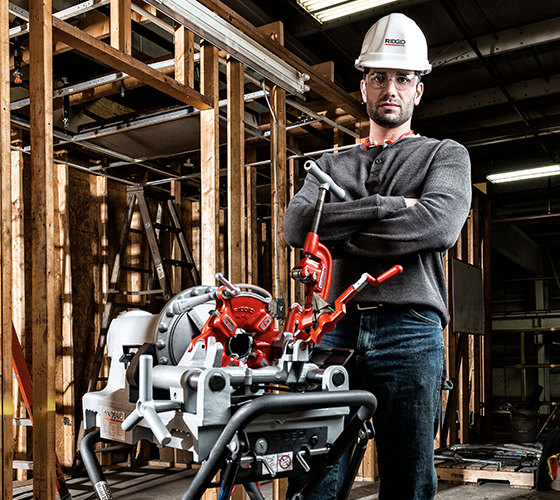 From our complete in-shop setups to portable, yet durable, designs -- RIDGID delivers performance that helps you get the job done with precision, safety and efficiency. The B-500 Transportable Pipe Beveler produces high quality bevels in 45 seconds* without flames or sparks. The compact design quickly mounts to pipe 4” and up with a maximum wall thickness of 1/2”, and creates consistent bevels in a single pass. If your job depends on joining, forming or connecting pipe, RIDGID threading and pipe fabrication equipment brings confidence and precision to every connection. The most efficient way to groove many pipe materials, including steel, copper, aluminum, stainless steel, PVC and copper nickel. Support and secure the pipes you are working on with dependable vises and stands. Cut and prepare pipe with certainty and precision. RIDGID Pipe Cutting & Fabrication tools offer the reliability and durability needed the most demanding jobs.